Hot on the heels of Australia, we’re pleased to announce our Latin American expansion. Alongside Brazil and Argentina, we now have flexitanks in Ecuador as well. Ecuador is the 70th largest export economy in the world and the 105th most complex economy and has in the recent years exported $18B, $5.25B of which being crude petroleum the country’s top export, and imported $16.4B, resulting in a positive trade balance of $1.54B. This week we had news back from our customer in Ecuador who is testing a trial shipment of crude palm oil with our flexitanks. 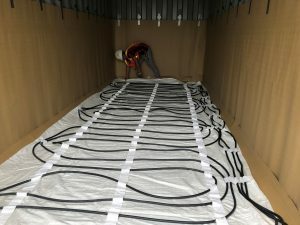 They successfully installed and loaded the flexitank with heating pads. 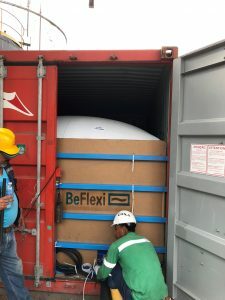 At BeFlexi, we place particular importance and emphasis on our quality control and safety procedures, especially regarding food grade cargo, as we do not just comply but exceed the industry’s standard guidelines and requirements. All our flexitanks come with a full set of Certificates and Approvals and have extensive product and liability insurance. We will keep working hard towards achieving more satisfied customers while sustaining the satisfaction of existing ones.